Mr. Lyman F. Giddens (1876 – 1963) – better known as “Judge” – served the town as mayor, city clerk and justice-of-the-peace. As mayor he was involve in the effort to bring a power plant and electric lights to Ray City, GA. He was also probably Ray City’s longest standing barber. Lyman Franklin Giddens was born in July 7, 1876 in Berrien County. His father, Hardeman Giddens, was a soldier in the C.S.A. His mother was Martha J. Gaskins. In 1900, Lyman F. Giddens, age 23, was still living in his mother and father’s household on the family farm, along with his brother William Giddens. His father owned the farm, free and clear, and the two sons worked as farm labor. 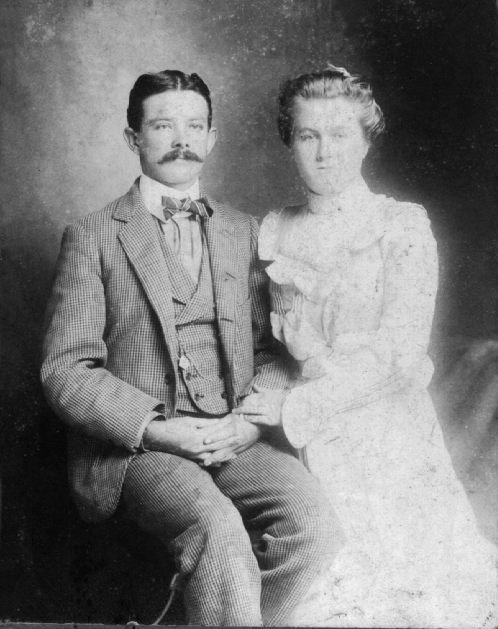 He married Essie Daisy Parrish on Jan 29, 1902 in Berrien County, Georgia. On September 12, 1918 Lyman Franklin Giddens registered for the draft. He was 42 years old, a self-employed barber working in Ray City, GA. The Registrar’s report described him as medium height, stout, gray eyes and black hair. In 1920 Lyman F. Giddens owned outright a house on Park Street, where the Giddens family lived. Lyman was 43 years old, his wife Essie was 34. Living with the couple were their three children, Inez, age 15, Homer, 10, and Ida Lou, age 7. At this time Lyman was already working on his own account as a barber. James Thomas “Jim” Phillips, (1880-1963) was 42 at the time of election. He was born and grew to manhood in Dodge County, GA., coming to Ray City some time before 1920, where he worked as a salesman. His wife died prior to the 1920 census, after which he boarded in the home of Ray City merchant J. Fred Hinely. About 1921 he married Maggie Lou Dugger. Elected councilman, Ray City, GA, 1922. By 1930, the Phillips had moved to Nashville, GA where Jim continued work in sales in the hardware line, and later worked as a commercial carpenter. Joseph S. Clements was a native son of Ray City. Born August 14, 1886, his parents were Levi J. Clements and Rowena Patten. His family founded the Clements Lumber Company, the big sawmill which operated on the north side of town. On June 29, 1916 Joseph S. Clements married Effie Mae O’Quinn. She was born April 19, 1893 in Wayne County, Georgia. When Joe registered for the draft on June 5th, 1917, Joseph gave as a reason for exemption from the draft, “on account of wife.” His draft card information shows that in 1917 he and Effie were living in Ray City. Joseph described himself as married, and self-employed as a lumber manufacturer and farmer. He was medium build, medium height with blue eyes and light hair. In the 1920s, J. S. Clements was Treasurer of the company. Elected to the City Council in 1922, he was a neighbor of fellow councilman Andrew W. Turner. Joseph S. Clements later served as Mayor. (see WWI Boom for Clements Lumber Company at Ray City, GA). John Albert Griffin was a son of Micajah and Mary Griffin, born October 22, 1889 in Ocilla, GA. As a boy, he helped his father with the family farm in Rays Mill, GA. In 1909, his parents hosted traveling evangelist Rebecca J. Fox in their home when her gospel tent was burned at Rays Mill. About 1911 J. A. Griffin married Beulah Griner and the couple rented a home on Pauline Street where they raised their children. J. A. Griffin became a merchant of Ray City. When he registered for the draft for WWI in 1917, he was described as medium height and build, with blue eyes and light hair. In 1922 he was elected to the City Council. Beulah Griner Griffin died May 15, 1928; John Albert Griffin followed her in death just six weeks later on July 1, 1928. They were buried at Beaver Dam Cemetery. 1922 marriage of Mary Theresa Tyler and Charles Oscar Carter. 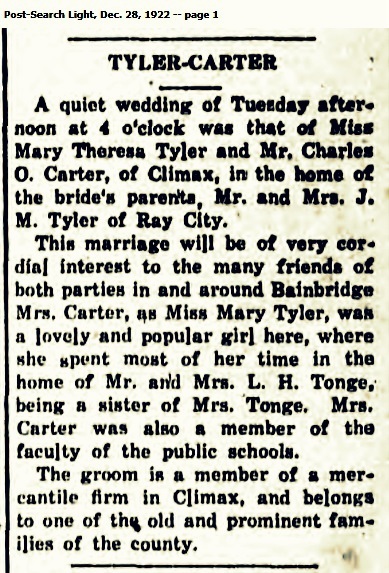 A quiet wedding of Tuesday afternoon at 4 o’clock was that of Miss Mary Theresa Tyler and Mr. Charles O. Carter, of Climax, in the home of the bride’s parents, Mr. and Mrs. J. M. Tyler of Ray City. This marriage will be of very cordial interest to the many firends of both parties in and around Bainbridge. Mrs. Carter, as Miss Mary Tyler, was a lovely and popular girl here [Bainbridge], where she spent most of her time in the home of Mr. and Mrs. Tonge. Mrs. Carter was also a member of the faculty of the public schools. The groom is a member of a mercantile firm in Climax, and belongs to one of the old prominent families of the county. The wedding announcement made the Atlanta papers, too! Milltown, Ga. December 28 – Miss Mary Tressa Tyler, of Ray City, and Charles Oscar Carter, of Climax, were married by Rev J. Frank Snell, of Milltown, at the home of the bride in Ray City Tuesday afternoon at 4 o’clock in the presence of a few relatives and friends. Immediately after the ceremony the young couple left for Valdosta. They will make their home in Climax. Miss Tyler is the youngest daughter of Mr. and Mrs. J.M. Tyler of Ray City. She is a beautiful and popular young lady. She has been teaching school in Bainbridge for the past two years. Mr. Carter is a popular young business man of Climax., being engaged in the mercantile business there with his brother. The bride, Mary Theresa Tyler, was born in Quitman, GA, a daughter of Mary L Knight and John M. Tyler. She was a granddaughter of Levi J. Knight, Jr., and a great granddaughter of John Knight. Mary Theresa Tyler came with her parents to Rays Mill (now Ray City), GA from Quitman, GA sometime before 1917. The family home was on Jones Street, next door to the residence of business owner J. Fred Hinely. Her father, John M. Tyler, was employed as a salesman in one of the general merchantile stores of Ray’s Mill. He was a founding member of the Ray City Methodist Church, and helped to draw the plans and construct the original wooden church building, along with Lucious Clements, W.M. Creech, Will Terry, and Mr. Patterson. Mary T. Tyler attended high school, at least in part, in Bainbridge while living with her sister and brother-in-law Mr. & Mrs. Tonge. Mary Theresa Tyler, of Ray City, GA attended high school in Bainbridge, 1918. After graduating high school, Mary herself became a teacher at age 19 and taught in the Bainbridge, GA schools. The Groom, Charles Oscar Carter, was a son of Lucy Callie Carter and William Carter, a prominent merchant of Climax, GA. Charles O. Carter was born July 27,1893 in Matthews, AL and had come to Climax with his parents as a young boy. As a young man, he was described as medium height, stout build, with blue eyes and light colored hair. He was employed with his father, as a clerk in the family mercantile business in Climax, GA.
After marriage, the couple made their home in Climax, GA. By the time of the 1930 census, Charles and Mary had two children; Charles Oscar Carter, Jr., age 6, and Carolyn Carter, age 2. Their house was valued at $2500 dollars, making it among the grander homes of Climax. The census noted that they owned a radio, one of only a dozen such sets in the entire town. Mary’s widowed mother Mary L. Tyler, was also living in the Carter household in Climax; her father had died of pneumonia and heart problems on February 26, 1930 and was buried at Beaver Dam Cemetery, Ray City, GA. Mary’s mother, Mary L. Tyler, died September 13, 1934 and was buried next to her husband in Ray City. The 1940 census found the Carters, Charles, Mary and the children, still residing in Climax, GA. They owned a home on Lee Street valued at $1800 dollars. Charles “Charlie” Carter was operating his grocery store, while Mary was a homemaker. Their son, Charles, Jr., was a freshman in high school, and daughter Carolyn was in 6th grade.